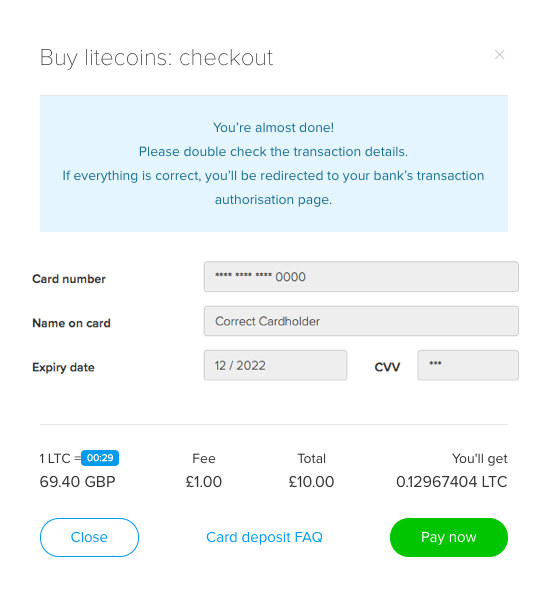 In order to purchase litecoins with your card, you need to make sure that you are verified in Cryptopay and have an active credit/debit card* issued in your name with the 3D Secure option enabled and sufficient funds to make this transaction. *We can accept VISA, VISA Delta, MasterCard, MasterCard Debit, International Maestro, UK Maestro, and VISA Electron. How do I go about buying litecoins with a debit/credit card? 2. 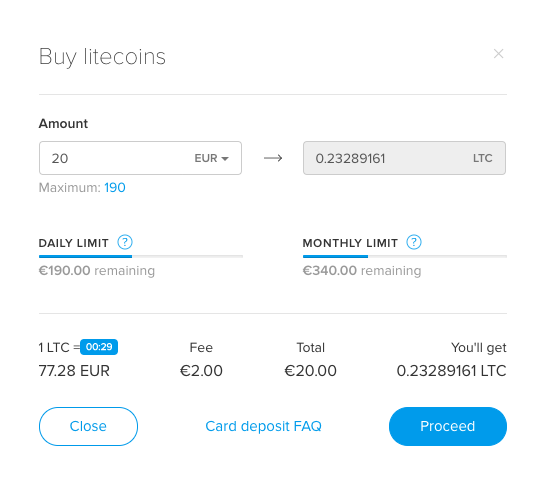 In the opened pop-up, in the "Amount" field enter the amount of funds you wish to purchase LTC with. Payments are processed in EUR, USD, and GBP. In order to avoid unnecessary conversion fees in the process, you can choose which of the supported currencies (EUR/USD/GBP) is more suitable for you. Funds will be converted automatically using the applicable rate of your Bank. Remember to stay within limits. To the right you'll see the amount of litecoins you are going to get. The exchange rate and the processing fee will be displayed at the bottom. Once you are ready, click the "Proceed" button. 3. On the next screen enter your card details. If you already have a linked card, you will see its details in this pop-up. Once you are ready, click the "Pay now" button. Please note: we don't keep your card details. They are tokenized in the encrypted form so that we can process your further transactions with this card. 4. 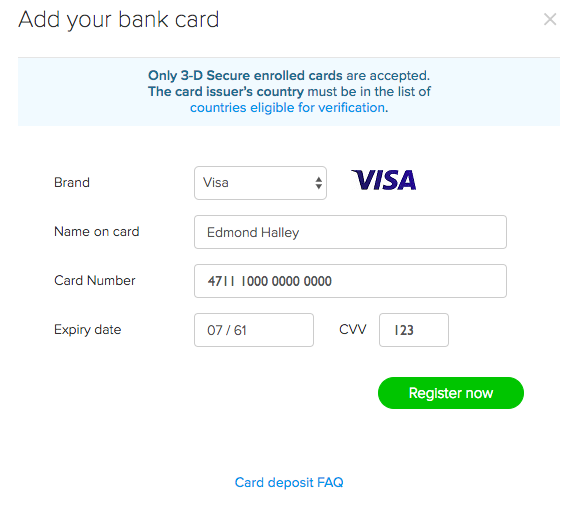 After pressing the "Pay now" button, you will be redirected to your bank's 3D Secure page. Enter the 3D Secure code, and you'll be redirected back to Cryptopay. 5. Once the transaction is successfully processed, you will see a pop-up with results and transaction details. 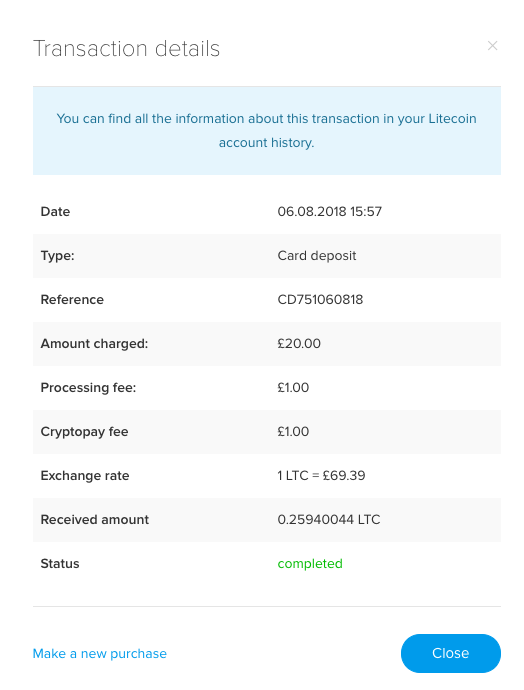 Funds will be automatically credited to your Cryptopay Litecoin wallet, and you will be able to see this transaction in the history of your LTC account. If you have any questions, please check the corresponding set of articles in our Help Centre. Feel free to contact our Support team if you have any questions that haven’t been answered in the articles.